The innovative ColciGel® Allopurinol Voucher Program offers patients affordable access to ColciGel® for acute gout flares and Allopurinol for the management of uric acid reduction. Save up to $10 per generic Allopurinol prescription with the Affordable Medication Solutions RX Savings Card on the COLCIGEL® ALLOPURINOL Savings Program. * Not valid for prescriptions reimbursed under Medicare, Medicaid, or any other federal or state program, or where prohibited by law. Where third party reimbursement covers a portion of your prescriptions, this coupon is valid only for a portion of the amount of your actual out-of-pocket expenses. Offer valid only for prescriptions filled in the United States. Affordable Medication Solutions reserves the right to discontinue this offer at any time. 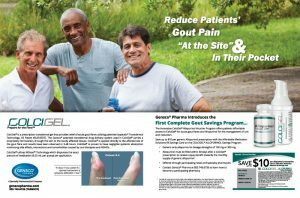 This coupon cannot be combined with any other rebate or coupon, free trial, or similar offer for the specified prescription. The discount will be accepted only at participating pharmacies.